Yesterday one of my family members bounded down the stairs and ran into the kitchen. “There’s a tornado in Oklahoma,” she said, “It’s on Facebook.”. I quickly went on Facebook and read my oldest son’s status. I got the message. And it scared me. By the time I found a news channel, it was all over. Good news – the weather system missed both my sons who live in Oklahoma even though the youngest was only a thirty- minute drive from parts of the devastation. Bad news – For so many neighborhoods so far from from where I live, life will never be the same. the eerie calm before the storm. The blasting rain and hail. How can I ever forget the small space under my school desk where I huddled in anticipation of a funnel cloud so fast and furious nothing could possibly stand in it’s way. 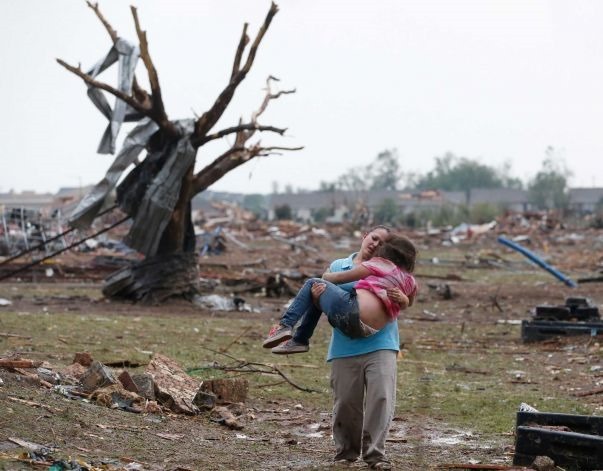 I cannot begin to imagine the first moment after the tornado passed – Men, women and children emerging from shelters to find themselves lost on a landscape of rubble. Neighborhoods flattened. A elementary school ripped apart. Cars piled up like discarded toys. Up in Canada, the devastation seems so surreal. Just pictures on TV. Phone calls from my kids who were a safe distance from the storm. I have family there and so do you. There are 62 churches in the town of Moore. That’s over 62 communities of believers just like you and me whose worlds have turned upside down. When the apostle Paul “if one part suffers, every part suffers with it..” he was talking about the body of Christ everywhere. But, you may point out, so many people suffer in so many places. What can an ordinary person do about it when we are so far away? The Parent trap- Comparing our kids like trophies or loving with the Father’s heart. I will pray for those in Moore, Oklahoma. Especially we must remember the children who survived the terror and pain of the storm. God bless you all in Moore. We feel your pain..